Draymond Green is the most accurate barometer of Golden State's engagement. Based on his play in the postseason, it's easy to see the Warriors' fuse is lit. This story is featured in the May 21, 2018, issue of Sports Illustrated. Interesting in subscribing to the magazine? You can subscribe here. From Charles Barkley to Rajon Rondo, Steph Curry to Kevin Durant, the executive in Houston planning for his comeuppance to the comedian in New Orleans pleading for his demise, Draymond Green can't seem to get through a playoff news cycle without someone threatening to push him off his square. That's the term he uses, a reference to the imaginary low block upon which he lives, wrestling the world for inside position. The square was a rhetorical gift from Warriors general manager Bob Myers, who drafted Green with the 35th pick in 2012, a brick-house power forward impossible to budge but easy to provoke. 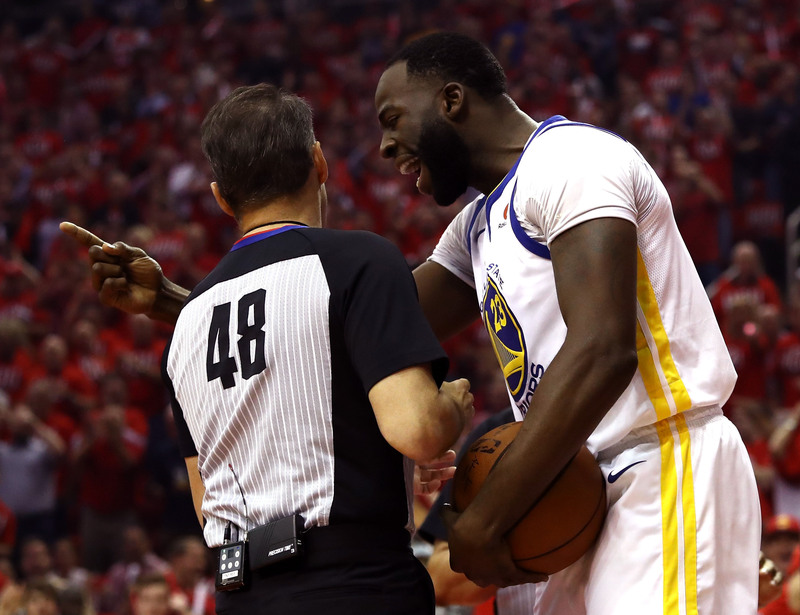 Myers has seen Green pick up 72 technical fouls over six years, one of which might have cost the Dubs the 2016 championship. Early this season the GM pulled him aside for what was probably their hundredth skull session on the subject of big hearts and short fuses. "Bob said, 'You can't be moved off your square so easily,'" Green says. "He went into a whole story. 'I drive to work and a guy cuts me off. O.K. That happened. Then I walk into the office and someone does something else I don't like. O.K. That happened too. After the seventh thing, I might get moved off my square, but not after the first thing or the second thing.' I know that sounds simple, but it resonated with me. It gave me something to focus on: my square." By Green's hyperactive standards, the regular season was tranquil, bordering on comatose. Games seemed trivial. Practices felt flat. He slipped from the conversation for Defensive Player of the Year, his defensive real plus-minus sliced almost in half from his league-leading +7.14 per game in 2016–17, his rebounding numbers as low as they've been since the Mark Jackson era. The Warriors won 58 games, which would have been cause for celebration then, but concern now. During a midwinter trip to Los Angeles, one staffer hummed Green Day's "Wake Me Up When September Ends," and a player stretching on the court at Staples Center nodded in approval. "When April ends," he cracked. Nobody in the NBA will empathize, but the Dubs are stacked to such a cartoonish extent that their stiffest challenge was actually the absence of challenge. "It was boredom," says an assistant coach. Green does not believe in switch-flipping, the well-worn notion that teams can dawdle through the regular season and dominate in the playoffs, as long as they employ an immortal (or four). But in the postseason Green's numbers have spiked from 11.0 points per game to 13.1, 7.6 rebounds to 11.5, 7.3 assists to 9.0. Golden State's defensive rating, a respectable 104.2 in the regular season, good for ninth in the NBA, is a league-best 99.3 in the playoffs. It's not that the Warriors are improved. It's that they're engaged. "The switch is a myth," Green says. "However, I do believe the focus picks up, the intensity picks up, because the games mean more. That happens." This year's Western Conference finals against the Rockets marks the first series since the 2016 Finals that the Warriors have any chance of losing. Houston won seven more games than Golden State this season, had a higher point differential and took two of three meetings, but again, it's impossible to know how hard the Dubs were trying. The most accurate barometer of their engagement is Green. In the conference semis alone, Barkley said on national TV that he wanted to punch Green in the face, and New Orleans comic Andrew Polk wrote on Twitter that he hoped Green would be shot outside the Smoothie King Center, surefire signals that Golden State is getting warm. In the Warriors' five-game win over the Pelicans, Green jostled with Rondo but he also called out Durant and Curry, chiding the headliners for their lack of aggression. Admonishing teammates is nothing new for Green, but the Warriors suggest that his delivery is different, more calculated. "His voice is powerful," says player development coach Bruce Fraser, "because he doesn't use it as much." In the press conference after a 119–100 loss in Game 3 in the Big Easy, when he took aim at Durant and Curry, Green sounded almost like a coach delivering a message through the media because he sensed a one-on-one conversation wasn't enough. "As you grow, you learn people and how they respond," Green says. "You understand when to say something and how to say it, the importance of tone. For me, I don't like to let stuff build. If something needs to be said, I'm going to say it, and you know I've always been that way. But I have to do it in a place of peace, instead of emotion, because if there's anger involved, it won't come out the right way." The Rockets are the best bet to push him off his square, and he theirs. Golden State eliminated Houston in 2015 and '16 largely by smothering James Harden at the rim. The Rockets run upward of 65 pick-and-rolls per game, mainly designed to create two-on-one advantages, with Harden driving, Clint Capela diving and an opposing big man left to pick up one or the other in the paint. "Not an ideal situation," Green laughs, though he may be the best qualified candidate to halt it, scrambling from ballhandler to lob threat. "It happens all the time. It's a cat-and-mouse game. Fake like you're going out, but you're really dropping back, or act like you're dropping back when you're really coming up. It's a split-second decision, and if you're a split-second late, it's a bucket. So whatever you decide, go with it. Don't be like, 'Ahh, maybe I should have done the other thing.'" 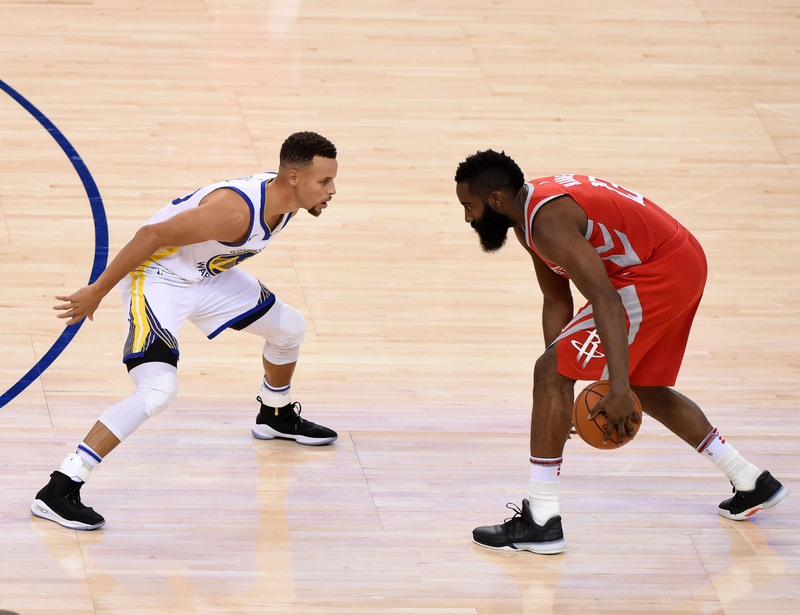 In previous years, the Warriors pegged the Rockets as predictable, given their stringent adherence to layups and standstill threes. They stayed home on shooters and switched pick-and-rolls, using Klay Thompson, Andre Iguodala and Durant against Harden, bothering him with long arms. The plan hasn't changed much, but Golden State coaches acknowledge that Chris Paul adds an important new dimension for Houston, since he mines open jumpers in the midrange. Like every other team out west, the Rockets have operated for the past four years under the Warriors' specter. They built a roster, not necessarily to stop the Dubs but to score with them. That's why they hired Mike D'Antoni in the first place. "Obsessed," Houston general manager Daryl Morey called his organization's quest, a sound bite that stuck with Green. Houston's defense is stiffer, but Rockets officials still joke that they will have to win four games 130–128. Green won't let that happen, for reasons going back to the old light switch. He might not believe in it, but his coach is a different story. "I knew we'd flip the switch on defense because we didn't try," Kerr says. Green, the overseer of the D, would ensure effort returned. But the Warriors' offense is an intricately calibrated instrument, and when practices are skipped and games are overlooked, cuts get forgotten and reads get missed. In a recent sequence they wound up with two shooters in the same corner because one neglected to pin. "Our offense does not have a switch," Kerr says, and in this moment he looks the slightest bit uneasy. It's a look no one in Northern California has seen for the past couple of years. The Warriors are still the heavy favorite. They're just not a mortal lock. Their offensive rating, tops in the NBA during the regular season, has slipped to third in the playoffs. Maybe it won't be 130–128. Maybe it will be 105–103. Green will be O.K. with that. "I think he could be a coach," Kerr says, "but I don't think he will. I think he's going to be the next Charles Barkley."